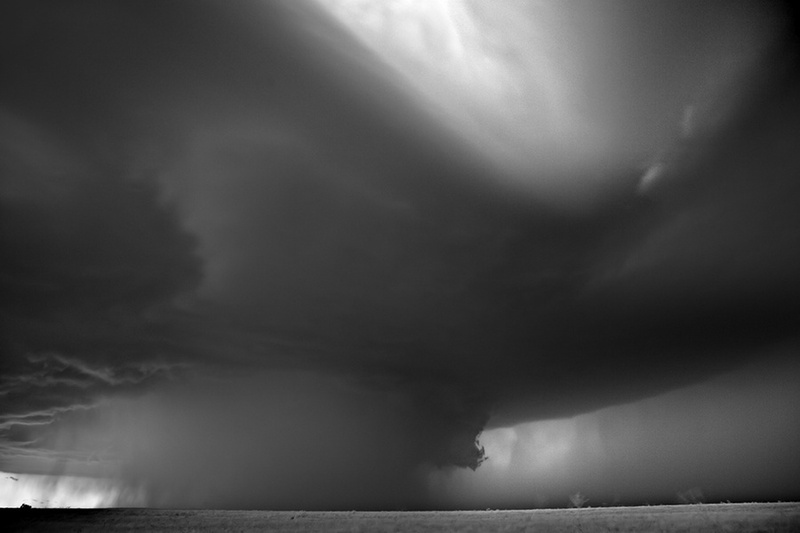 photo-eye Gallery is pleased to announce new work by photographer Mitch Dobrowner. This newly released work is a continuation of his Storms portfolio and coincides with the recent publication of his first monograph by 21st Editions titled Prism Series: Mitch Dobrowner. Dobrowner has always eagerly anticipated the nastiest weather, waiting on his meteorologist's predictions to decide when it's a good time to go out and photograph; his newest landscapes certainly attest to the weatherman being on his side. Venturing even closer to storms than we have seen in his previous work, Dobrowner's photographs feature the awesome power of twisters in moments of furious beauty, capturing the force itself rather than the devastation they leave behind. Dobrowner’s photographs illustrate the unique and constant beauty nature provides should we take a moment to look above our own heads. As a photographer living in the Southwest, I can attest to my own desires to photograph the "big one" as it builds in the distance, the sky darkening around my mountain home. But desire and practice are often two different beasts; seeing a storm brewing a few "crow" miles in the distance does not necessarily lead to getting into my car and driving straight towards it. Even on the days when I do go out to experience the weather, actually making it to the site of the storm and witnessing said storm from a place where I am compositionally happy are two very independent challenges. What’s more, Dobrowner manages to accomplish this with the honed eye of a view camera photographer. Anne Kelly and I are often asked if Dobrowner uses a 4x5, or even an 8x10 camera and it’s not long before all parties are laughing when we consider the photographer huddled under his dark-cloth directly in the path of an approaching tornado. But the question is not without its merit. 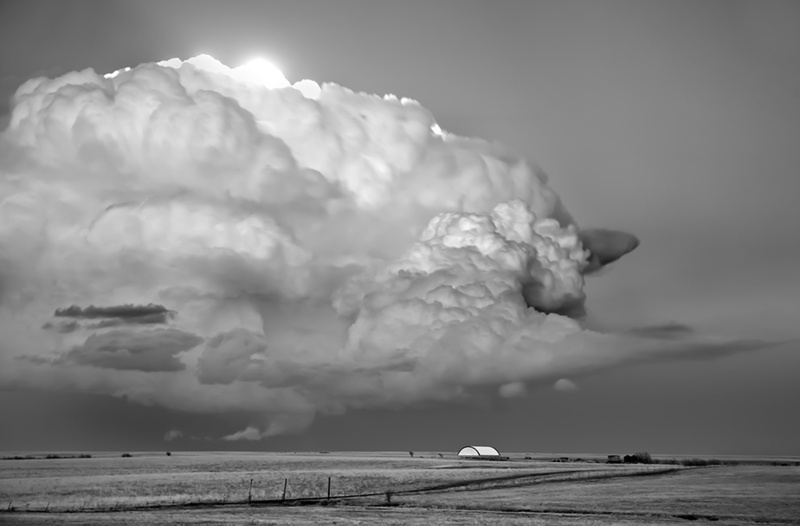 Discount for a moment the ominous presence of the storms; as landscapes Dobrowner's images are solid. When viewing photographs like Veil or Dark Star, my eye first assumes that there is some tilt-shift trickery afoot, a bend in the perspective which straightens out the sky over our heads and sets it firm and tall into the scene. But from speaking with Dobrowner, I know this is not the case; what makes these images special is the artist's celebration of the stratosphere. Consider Oort Cloud; in the absence of weather, this would be a fine landscape photograph depicting the the vastness of the land, the minimal human presence in a land obviously cultivated by man. But with the cloud over head, we understand the fragility and temporariness of this scene. We understand that despite how we alter the landscape, nature is a force much bigger than us. See the new work here. 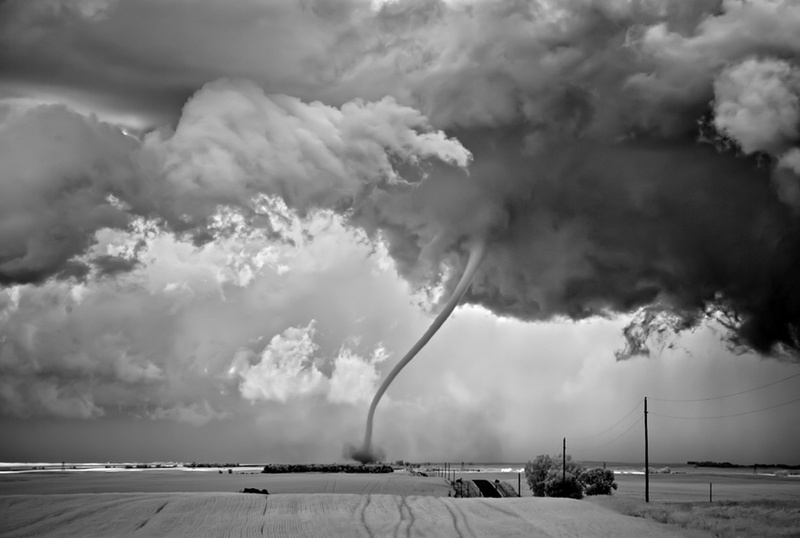 To learn more about these and other works by Mitch Dobrowner or to acquire specific prints, please contact Anne Kelly, photo-eye Gallery Associate Director at anne@photoeye.com or by phone at (505) 988-5152 x202. Prism Series Book 2 with photographs from Mitch Dobrowner's Storms series is printed by 21st editions and is limited to 280 copies. Books are presented in a handsome hand-made clamshell box accompanying a silver gelatin print by the artist. Find more information on the book here.